AROUND THE WORLD IN 80 BOOKS READING CHALLENGE 2014! 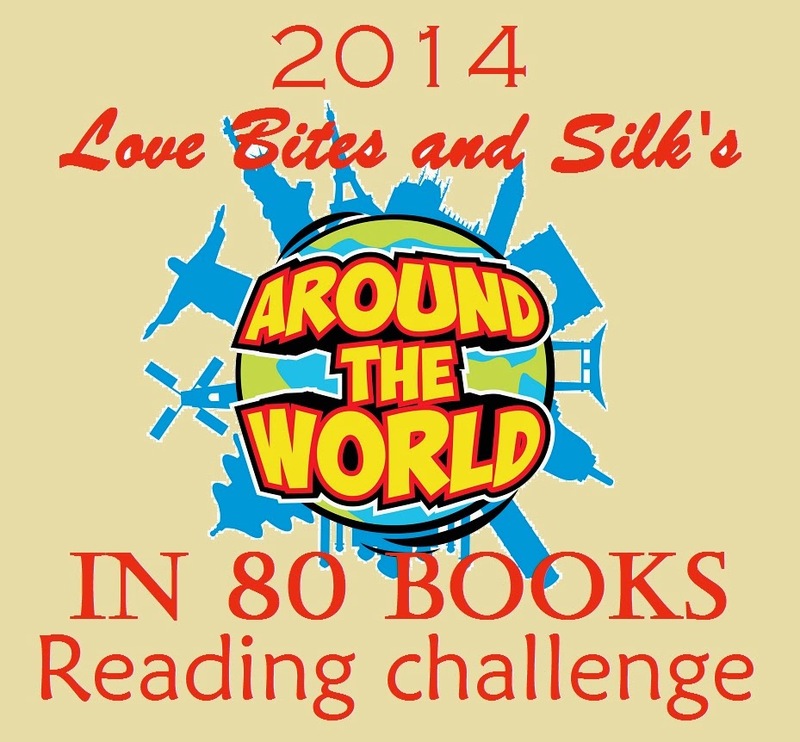 Welcome to the Around The World In 80 Books in a Year Challenge 2014! Please see below for all the details of the challenge. This challenge celebrates the diversity in books by location and culture. To sign up, make a post on your blog about participating in the challenge and link it up below. Feel free to use the banner above, and link back to this post, so others can join the challenge if they wish. Thank you. If you have any questions or want the linky code, just leave a comment for me below, please. You will collect gems for each part of the challenge you complete. Read 80 books in 2014. They can be any fiction genre and any length, as long as they are published and are available to purchase. Since this challenge is about going round the world, read books set in different locations of the world. For example, there shouldn't be two books set New York. Complete this mini-challenge and collect the rare red gem. Read at least one book set on each continent –Africa, Asia, Australia, Europe, North America, South America and Antarctica. If you need help finding books set in Antarctica check out this Goodreads List. Complete this mini-challenge and collect all 7 green gems. Read our selected book of the month. There will be one each month. Complete this mini-challenge and collect the 12 yellow gems. The coveted blue gem will be awarded to all those who complete all the mini-challenges and collect all the green, yellow and red gems. You don’t have to select your books ahead of time. Feel free to add them as you go along. Also feel free to change them if you list them and then change your mind at a later date. The books listed can also be used in other challenges. Feel free to join in at anytime, as long as the books are read in 2014. Book formats include paperbacks, hardbacks, ebooks and audiobooks. This is a fiction only challenge. Anyone can join in. You don't need a blog. Simply leave a comment below with the name you will be using for the challenge and add the link to your Goodreads, Amazon, or any other site you use to track your books. Every month, there will be an Around-The-World-In-80-Days post where everyone can post links to their book reviews and discuss the books they've read. Add Your Link at the bottom of this post. Please use the DIRECT URL of your participation post to sign up to the challenge by adding it to Linky List below. DO NOT just add your BLOG URL as people won’t be able to see how you’re doing and offer support! 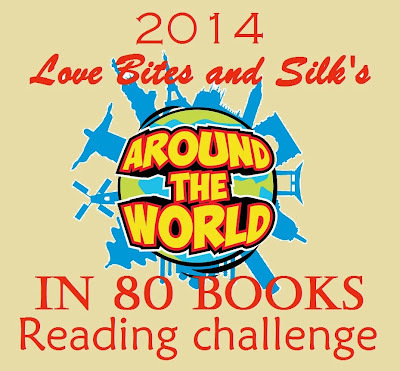 To sign up for the Love Bites and Silk Around The World In 80 Books Challenge 2014 please add your link below. Please add the DIRECT LINK to your post about the challenge NOT your blog URL. 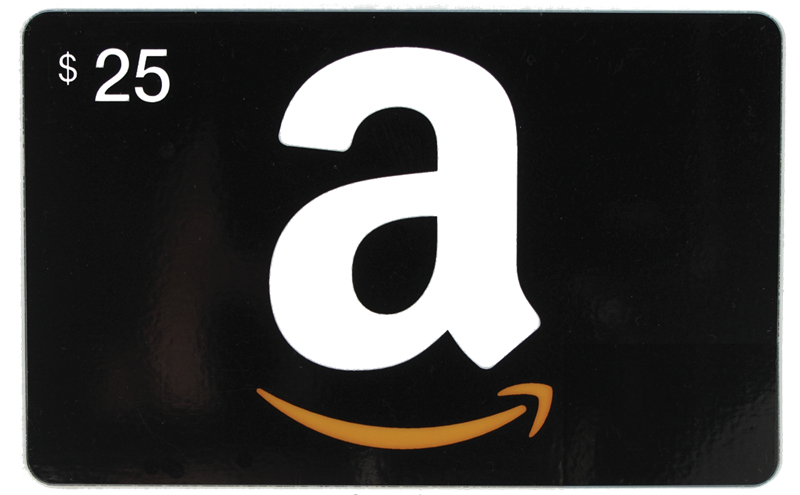 Everyone who completes the challenge is entered in to a prize draw to win a $25 Gift card. The winner will be chosen and announced in January 2015. Wow! This sounds like fun! I've never done challenges like this one before. I'm thinking about jumping in! It sounds like a great challenge. I love reading books from around the world. I'm just wondering about the 80, that's a lot of books and I'm a slow reader. Thinking seriously about it. Good point, Nana. I've amended the rules to accommodate the slow readers. I hope you will join in. I like the new additions. I'm in. This is a very tempting idea. I thoroughly love the gem collection idea but am such a slow reader, I can't cope with the pace of this challenge. I wish everyone participating happy reading. If you require posting of information on my blog at any time please let me know. The gem idea is lovely but it's a little complicated for my simple mind. But I read fiction widely and love the idea of the challenge. So I'm in. Hey, I am in and I added my link, but is there anyway to change the name it shows up as to T.M. Opperman since that is what I write under? If not it's no big deal. Also, I made a cool map to keep track of my books and am willing to email it over to anyone who wants it. please add me, I do not have a blog but read most everything I can get my hands on. I'm in. I read 115 fiction last year, so the part I'll have to think about is settings, making sure I have at least 80 different ones. And I guess fantasy and science fiction wouldn't qualify unless the settings are real world ones? When are you going to post the book of the month for January? Can't commit this year, enticing as it sounds, but I've tweeted. Good luck, readers! Really excited for this one. I like all the mini challenges, and I'm hoping to get the continents because I know there are a lot of places I don't normally read about! Thanks for the great challenge! Would love to accept the challenge but I don't have a blog. Any way to participate with just email? If you're on Goodreads, simply add the link to your Goodreads's profile or to your Amazon review page or any other site you use to track your books. My blog is Queendsheena (#3) on the list. I no longer plan to participate so please remove my blog from the list. Thank you. how do you sign up with out a blog? I asked to join before but dont see my name. Also how do you add this to the good reads , sorry Im not very computer savy. I see someone else asked also. what is the linky code to add to goodreads? This is going to be fun! Can't wait to start! Hi all, I would love to join this challenge! I've added the link to my Goodreads shelf "Around the world". My goal is to read 52 books set in 52 different countries this year. Hello. I would love to join as I have some friends who have done this challenge before and loved it. I don't think I will manage 80 in a year as I know how hard it is to track down books from so many different places. I added your challenge link to my profile at goodreads as linked above. Worthy information! I've read your article "Around The World In 80 Books Challenge - Sign Up Here". Great sharing! Sounds fun. Would like to add the link to my blog. How do I do that?